The tube or metro style map above shows all the host cities of the Summer Olympic Games from 1896-2020. They’ve grouped them by 4 eras: pre-World War 1, interwar years (or pre-World War 2), Post World War 2 – Cold War games and finally the Modern games. 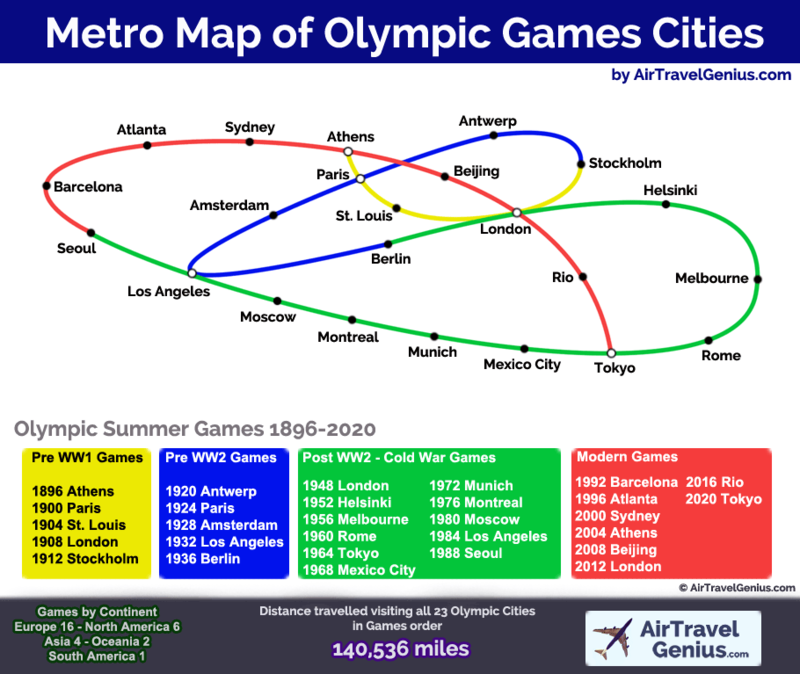 The map itself is quite clever as the various lines intersect with cities who’ve hosted multiple times such as Athens, Paris, Los Angeles, and London’s record 3-times hosting the games. Tokyo will be the first Asian city to host the games twice when it does so in 4 years time. If you’re curious about the cities themselves and the years they hosted you might find the following intersting. The following 3 cities were scheduled to host the games but WW1 or WW2 got in the way. Finally, if you’d like to fly between each Summer Olympic host city in order, you’d rack up 140,536 miles (226,171km) or about 5.5 times around the world.